IN a month of anniversaries that includes 40 years since the last ‘Westerns’ were withdrawn and 35 years since the quirky Holyhead Breakwater shunters were scrapped, we celebrate our own major milepost: 250 issues. Rail Express was launched in 1996, right in the middle of the privatisation of British Rail, and we have tracked the ever-changing railway scene since then – always from an enthusiast’s point of view, with an eye on what’s happening to the locos, units, coaches and wagons. Our founding premise was ‘for enthusiasts, by enthusiasts’, and that’s as true today as it’s always been – not least because many of our writers from Issue 1 are still with us today, which hopefully speaks volumes about the magazine itself. I personally still feel much like the new boy around here compared to the rest of the team, having only joined at Issue 207. So I must thank everyone involved with the title for their consistent support, professionalism and expert input – not just the writers but also the design, production, sales and support staff in the editorial office at Mortons – as well as those that have sat in this chair before me and helped us reach this point in our history, namely Philip Sutton, Murray Brown and Gareth Bayer. 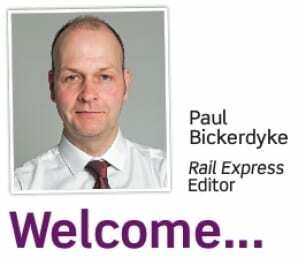 But most of all I have to thank you, our readers, because without you there would be no Rail Express and your valued support is much appreciated. Rest assured we will do our best to keep you informed and entertained for the next 250 issues, bringing you the best in modern traction news, nostalgia, photography and modelling every month.